What's an RV? Think of a sports car, except when you pull on the wheel, the sports car does nothing! 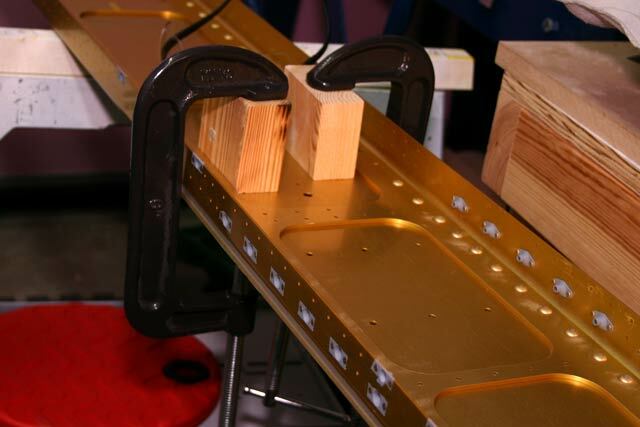 The tiedown bars have no holes in them, so they have to be match-drilled to the spar. You first drill a single hole according to the dimensions in the plans. 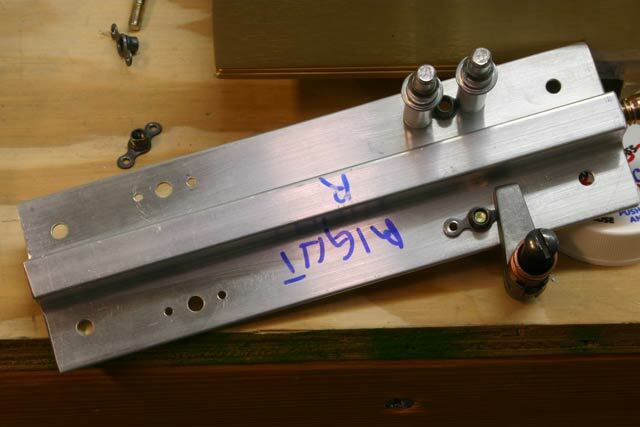 Then you put a bolt through the hole and line up the bar perpendicular to the spar flange. 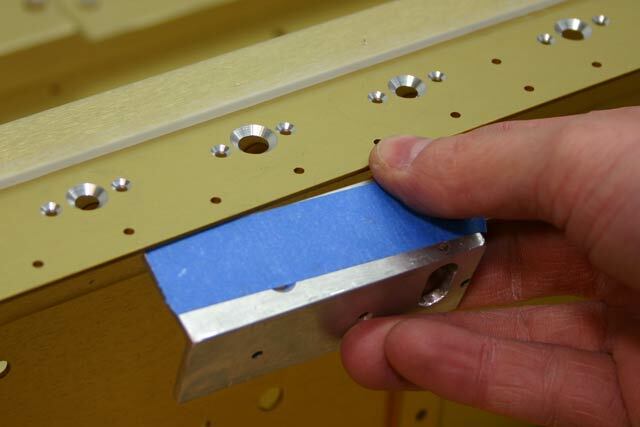 Once everything is lined up, the rest of the bolt holes are match-drilled using the spar as guide. I set the spar on two sawhorses and clamped the tiedown bar and spacers with C-clamps and some wood to keep from scratching anything. 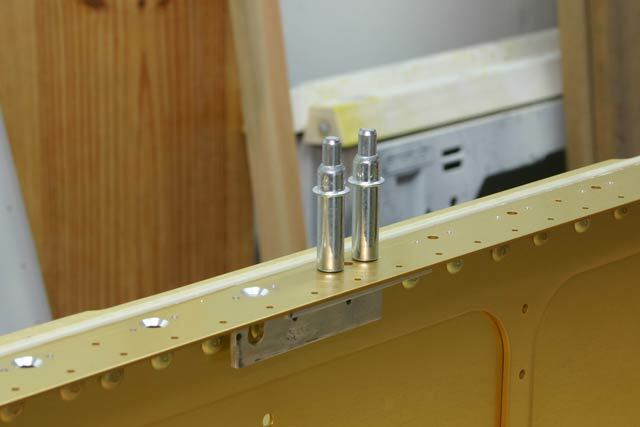 Once the tiedown bar had all bolt holes in it, you have to drill in the four platenuts that will hold the aileron control bracket. 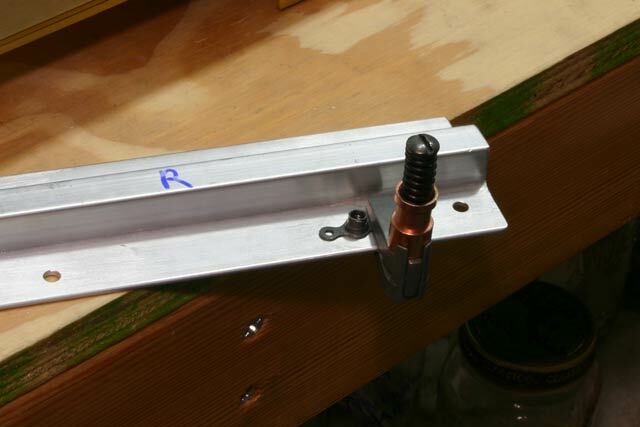 I put a bolt through a platenut and clamped it in place. 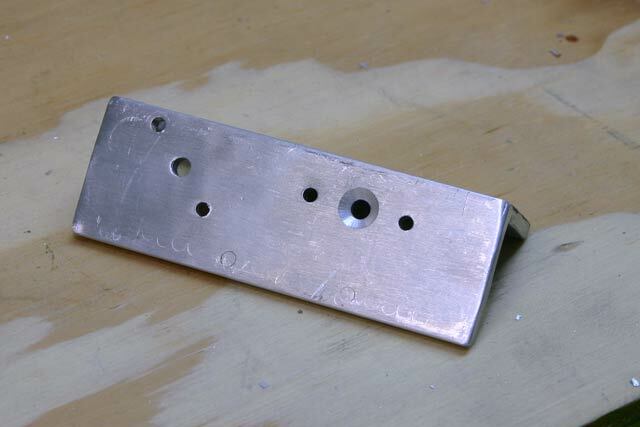 After drilling the clear hole, I put a cleco in it and drilled the other one. Note that I don’t have the spacer bar in there just yet. 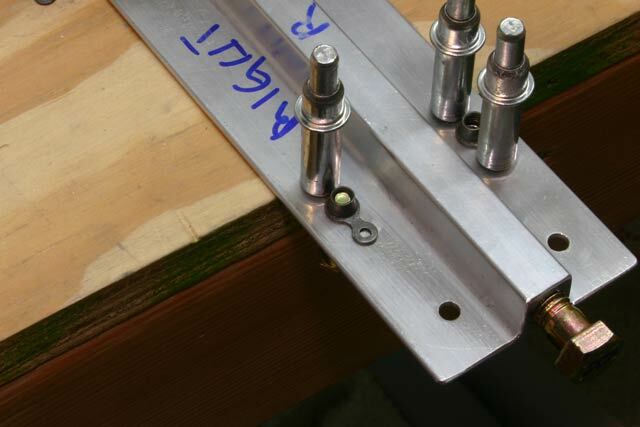 Once all the platenuts are drilled to the tiedown bar, it’s a good idea to mark them and know which platenut goes in which hole — Since these are not match drilled, any small variations in drilling are going to make things hard later on if the same platenuts are not used in the holes for which they were drilled. After drilling the holes through the tiedown bars, I match-drilled the spacers, with a bolt in place just to make sure things didn’t shift. Finally, I went to drill the lightening holes in the tiedown spacers. the plans specify a 1″ diameter hole. My hole cutter will only cut holes to 1-1/4″, so I decided not to use it (the hole would get too close to the bolt and rivet holes. The next step in the process is fabricating the tie down bars. 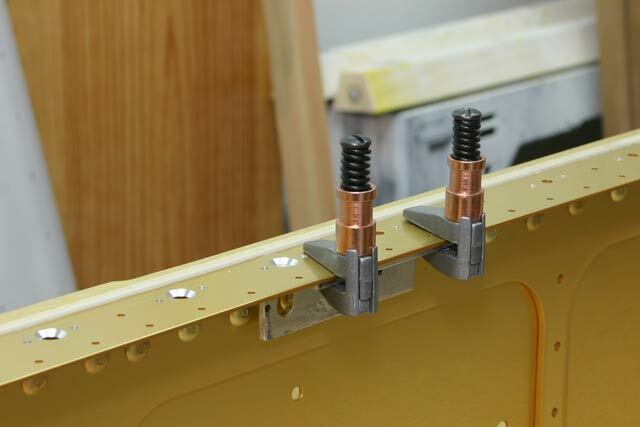 These bolt on the spars and hold the rings used to tie the plane down. Behind each tiedown bar there are two spacers that support the bar. These have to be fabricated from aluminum stock. 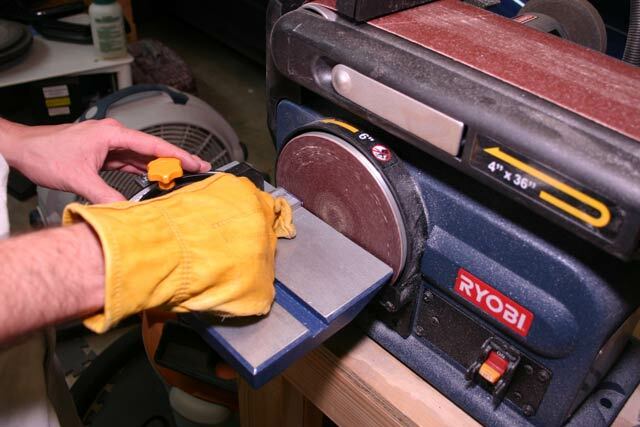 I bought an abrasive cutter at Harbor Freight for $30, and it sure beats a hacksaw for making quick, clean cuts. 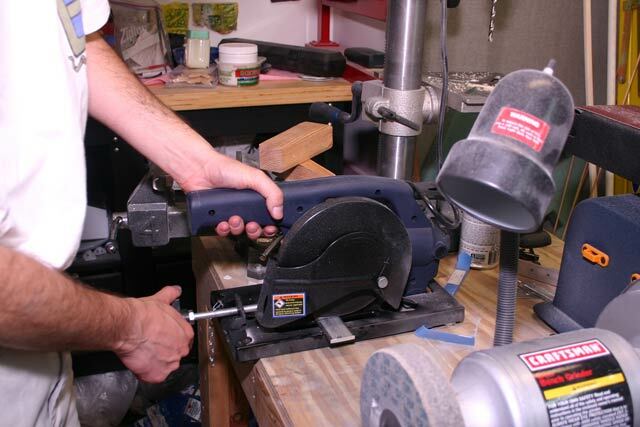 After making the cuts, I put them on the belt sander to straighten and smooth up the edges. Finally, actually riveting the platenuts to the spars went pretty fast. I did all of them in about two hours. After leaving the JB Weld alone for a couple of days, I figured it was about as dry as it would get. 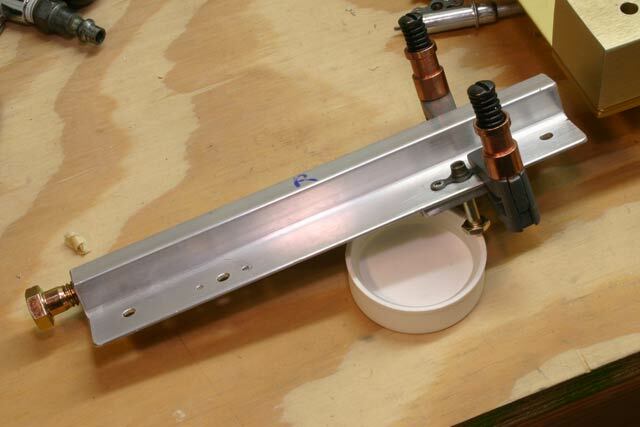 I first used my Scotch Brite wheel on my air grinder to polish the epoxy so it is flush with the spar flange. This stuff is pretty easy to take off, so I had to go slowly and carefully. I manged to not expose too much more bare aluminum along the way. 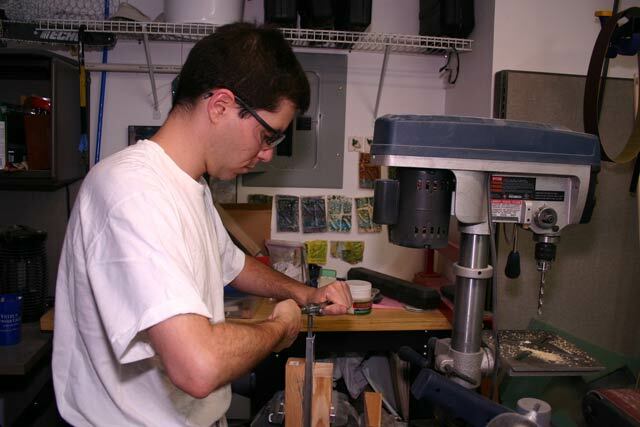 Then I used my handy aluminum angle guide to drill a another hole. As you can see in the picture below, I had to cut off some of the angle to allow the 90 degree drill to fit perpendicular to the flange. I got this drill from Brown Tools on a sale. I’ve only used it two or three times, but it’s already paid for itself. Finally, I countersunk it again, being careful to not go too deep this time. Doesn’t look as shiny as the original, but it actually looks pretty good, considering…. Now on to more interesting stuff…. I emailed Van’s aircraft asking if it was OK to just leave the one oversized hole alone, or whether I should try to fix it. 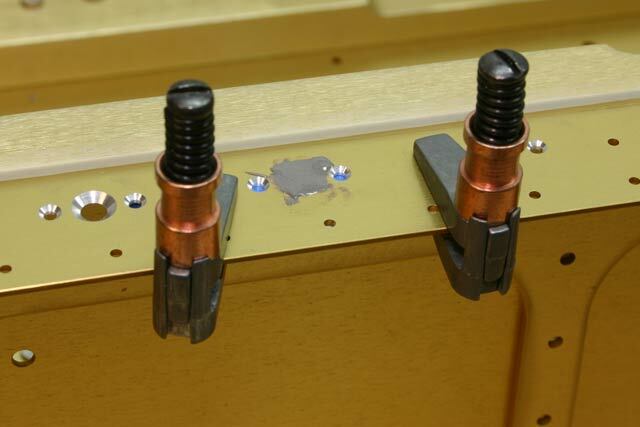 I am not the first guy to screw this up, and they have a method (using doubler plates and aluminum slugs) where you basically drill out the countersink, and then stick a slug in the hole, drill the hole again, and countersink to the right depth. Not something I really wanted to do. 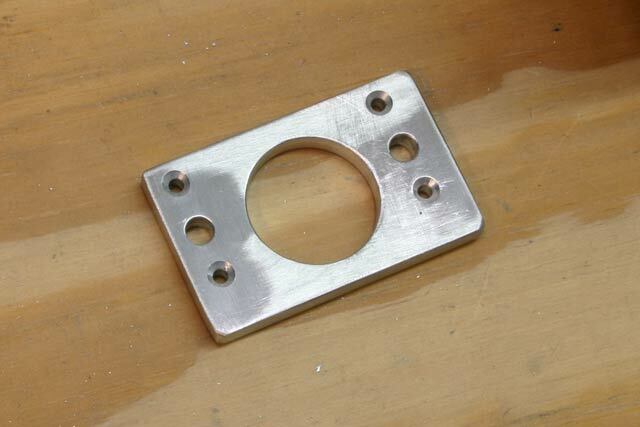 First, I needed a way to cover the hole so the JB Weld doesn’t just ooze out of the bottom of the flange. 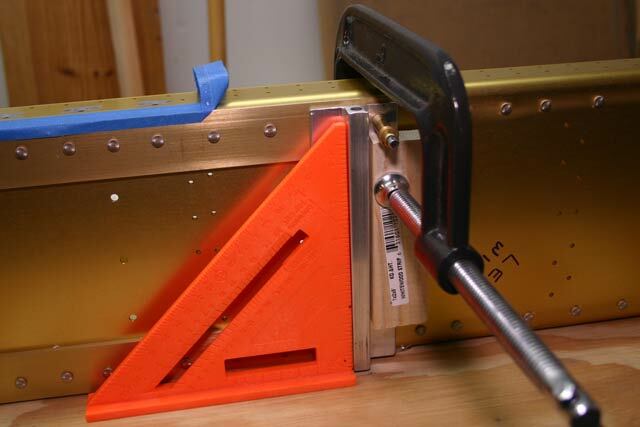 I covered a piece of aluminum angle with some painter’s tape (so I don’t weld the angle to the spar!). And finally I covered the hole with JB Weld. On my test run, I wiped all of the excess JB Weld so it was exactly even with the surface. When it dried, it became a little too concave. So, instead of doing the same here, I put put it on, but didn’t wipe the excess off. This way, when it dries, I’ll just use my little Scotch-Brite wheel on the air grinder to make it exactly even with the surface. This stuff cures in 24 hours, so tomorrow we’ll see how this turns out. It seems like I’ve been drilling holes for the past three weeks or so! 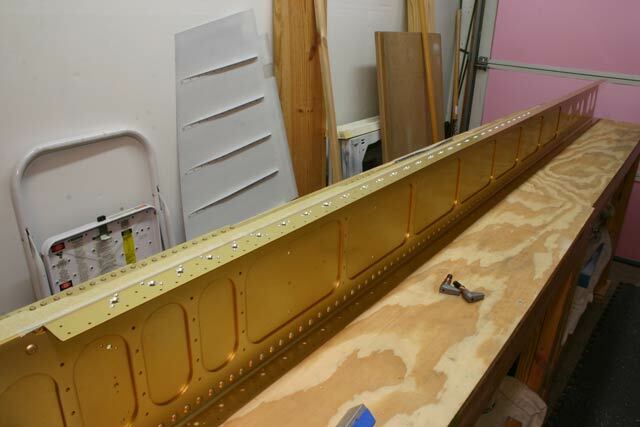 The first task on the wings is to drill and countersink the holes for the tank attach platenuts. The fuel tanks on this plane are part of the leading edge of each wing. They attach to the wing with a total of 60 screws. 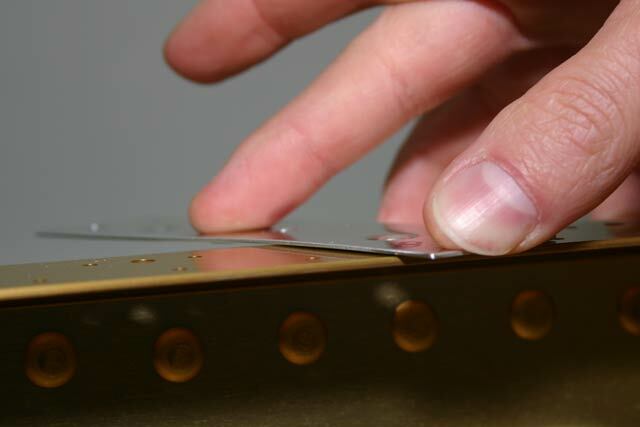 Each screw goes into a platenut, and each platenut is attached to the spar with two rivets. So, each spar needs a total of 180 holes. The center hole (where the screw goes through) on each platenut needs to be countersunk so the tank skin can sit flush with the spar flange. 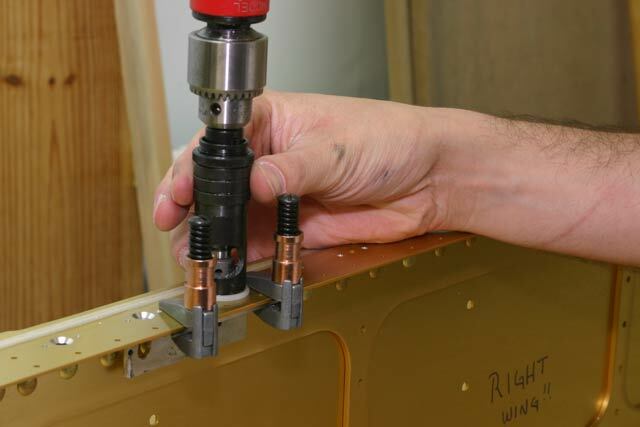 The problem is that as you countersink the spar to allow the skin to sit flush, the hole will start enlarging, and the countersink pilot will start to wobble. Van’s Aircraft recommendation is to first rivet the platenuts to the spar, and then use the platenut itself as a guide for the pilot. I wasn’t convinced this would work out quite right, so I decided to go with another method I saw on Dan Checkoway’s web page. 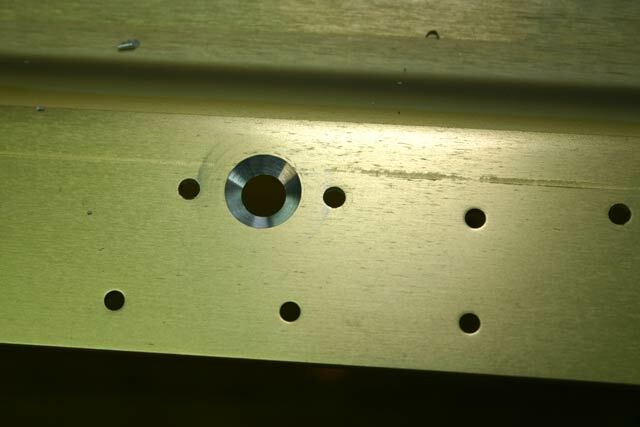 Since some of the holes are parallel to the spar and some others are at 45 degrees, I drilled both patterns in one piece of angle (some other holes are at “-45” degrees, so I used a separate piece of angle for those). 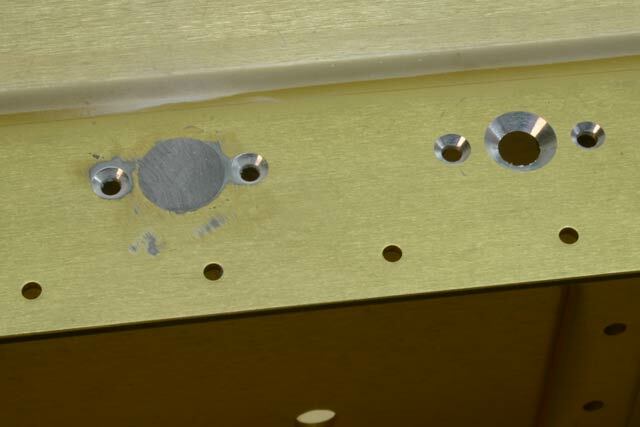 — Oh, and don’t pay attention to the countersinking on the middle hole on the right. 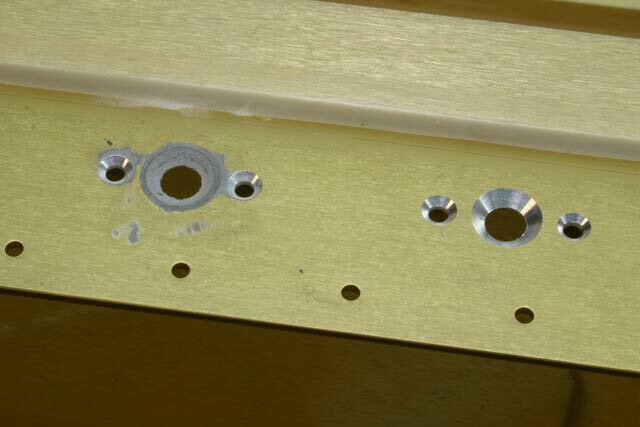 This happens as you start countersinking and the spar hole gets enlarged. 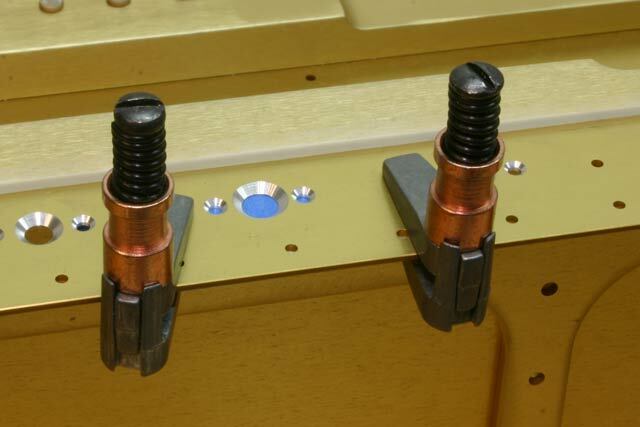 Finally just place the countersink pilot through the pilot #30 hole and countersink away! No wobbling, no chattering, etc. 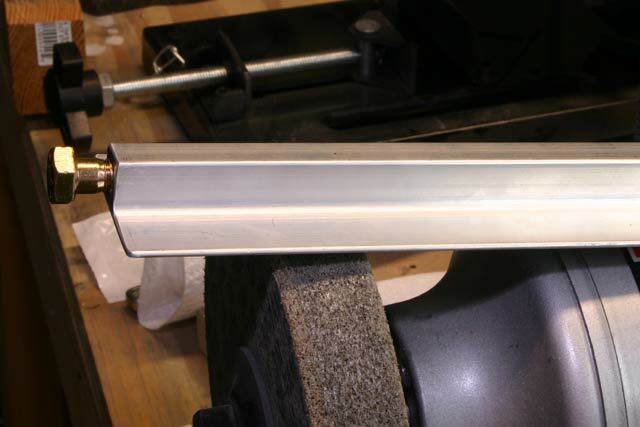 I then used a piece of aluminum dimpled for a #8 screw to make sure it would sit flush against the spar flange. 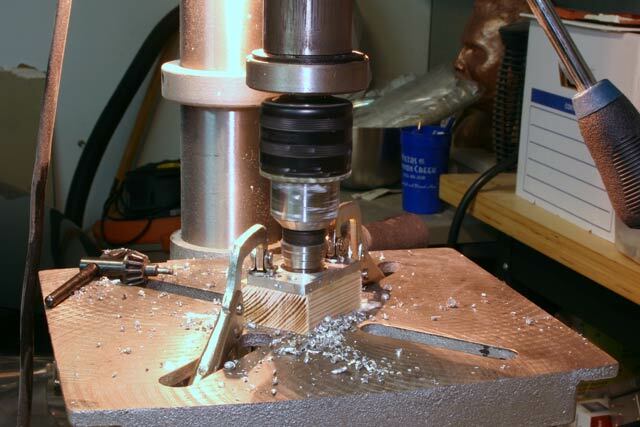 The countersink is a lot deeper than it needs to be. 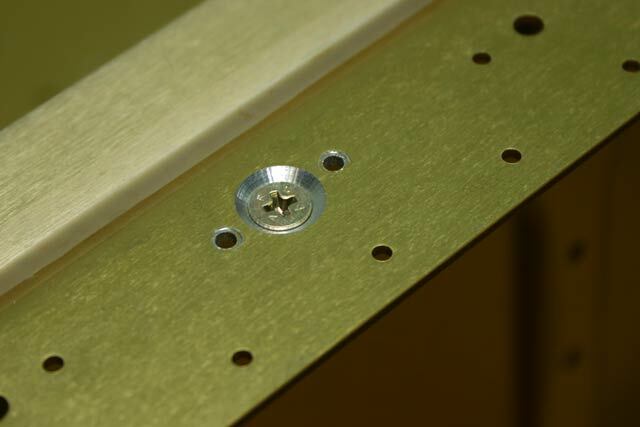 Van’s advice is to countersink enough so the screw head sits flush with the spar flange surface, and then go ‘a few more clicks’ deeper. 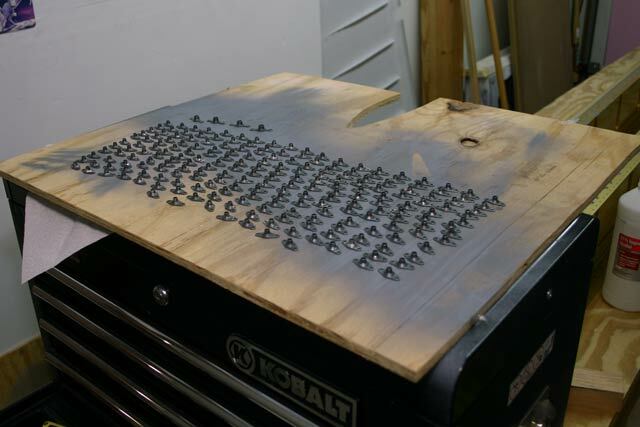 One click in the countersink cage is 1 mil (0.001″), so they probably mean about 5 mils deeper. 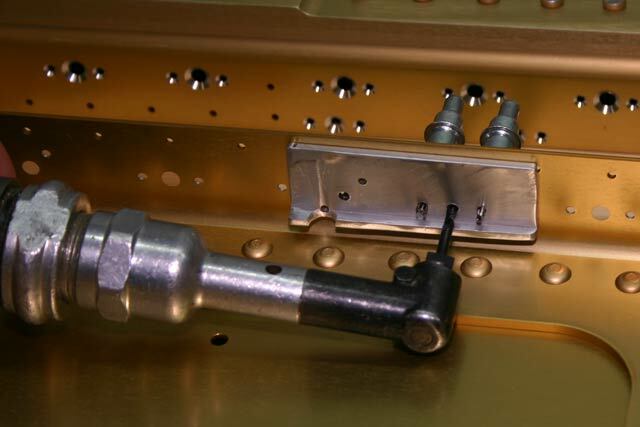 Even if the dimpled piece doesn’t sit exactly flush now, it will be flush once the screw is holding it down. Fortunately, I only screwed up one of these holes. I used Van’s recommended depth for the rest of them, and they all turned out much better. 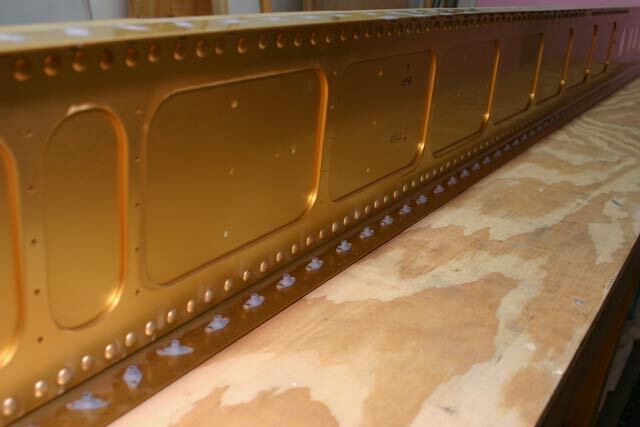 Today I finally finished countersinking all the tank attach holes, as well as the inspection plate holes. 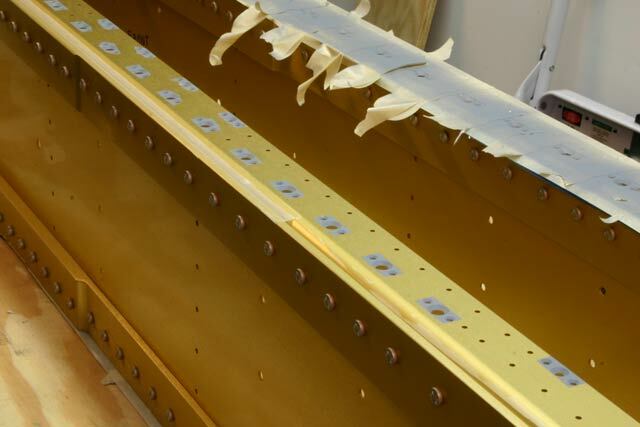 There are three inspection plates on the bottom side of each wing, and each one has four screws going into the spar flange (and a bunch other going into the wing skin). Oh yeah, did I mention how many freaking holes there are in this thing?? Luis & Fab's RV-7A Construction Log is proudly powered by WordPress | Entries (RSS) and Comments (RSS).